Many of my smaller projects involve giving advice on the decoration of eighteenth century houses, listed or otherwise. This latest was in a house on Holly Mount in Hampstead village. Possibly one of the smallest houses I have ever been in with one room on each floor and incredible views from the top window. 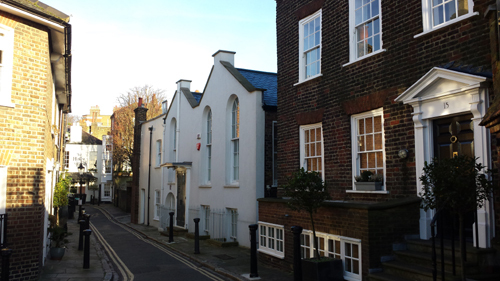 Holly Mount is an interesting group of early/mid eighteenth and nineteenth century buildings. At the north end is the well-known Holly Bush pub. Apparently this building originally dates from 1643 and was converted from the stables and outbuildings of the artist George Romney’s house, which is behind it. It became a pub in 1807. 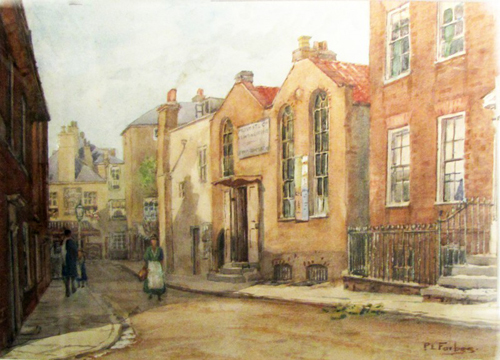 The distinctive Baptist chapel was built in 1818 and can be seen in this watercolour by Patrick Lewis Forbes of about 1890. What a delight to come upon your pages whilst researching on distemper. All this chalk paints, a builder said used to be distemper. An American page advises?? make your own chalk paint..
paint water & plaster of paris.